This week, the AAUP authorized an investigation into apparent departures from widely adopted standards of shared governance at Vermont Law School after the school’s administration and governing board “restructured” the faculty by lowering salaries, reducing the number of full-time positions, and stripping many of tenure, all without involving the faculty in the decision-making process. A June 5, 2018, memorandum presented fourteen tenured professors with a stark choice: either surrender their full-time, tenured positions and faculty voting rights, sign an agreement containing general and age-discrimination releases along with nondisparagement and nondisclosure provisions, and accept nontenured appointments at lower pay, or have their appointments summarily terminated as of July 1, 2018, with immediate cessation of salary and benefits. After one faculty member contacted the AAUP seeking assistance, we wrote to the administration three times highlighting our concerns in the case and reiterating appropriate procedural standards for terminating appointments because of financial exigency. In addition, with only five faculty members having retained tenure at an institution with more than six hundred students, the restructuring appears to have effectively eviscerated the existing tenure system and, with it, protections for academic freedom. AAUP investigating committees in the area of college and university governance are charged with inquiring into cases that appear to feature severe departures from AAUP-supported governance standards. Committees are composed of AAUP members from other institutions who have had no previous involvement in the matter. If the investigating committee’s published report finds that serious violations have occurred, the AAUP may place the institution on its sanction list by vote of the Association’s annual meeting, which informs the academic community and the public that conditions for academic governance at the institution are unsound. We will keep you apprised of developments in the case. If you’d like to support our investigative work around shared governance and academic freedom, please donate to the AAUP Foundation, which supports our investigations. Categories: announcements, comments | Tags: age-discrimination, American Council on Education, Association of Governing Boards of Universities and Colleges, shared governance, Statement on Government of Colleges and Universities, Vermont Law School | Permalink. We had a big win in Iowa this week, with 97% of voting faculty at the University of Northern Iowa voting in favor of recertifying their union, the United Faculty/AAUP. Recertification became necessary after a 2017 bill drastically altered Iowa’s collective bargaining law for state employees. In addition to limiting the mandatory and permissive subjects of bargaining (for example, health insurance and evaluation procedures are now prohibited subjects of bargaining), the bill also eliminated payroll deduction and requires recertification of the bargaining unit one year prior to the expiration of each collective bargaining agreement. In order to maintain its certification, United Faculty needed to get majority support from all eligible faculty members, not just a majority of those voting. In effect, there was no way to remain neutral – not voting would be counted as a vote against the union. Of the 643 faculty members who were eligible to vote in the election, 547 faculty members voted in favor of United Faculty and only 17 faculty members voted against the union. Iowa has long had laws unfriendly to workers, so our UNI colleagues have been operating under a Janus environment for quite some time. 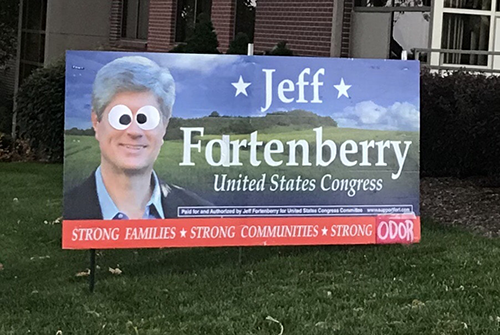 These election results, however, show that UNI faculty clearly see the value of their union and support the union’s work. The chapter plans to build on this victory by increasing membership numbers over the rest of the academic year and is set to begin bargaining for a new contract before the year ends. Congratulations to all the faculty at UNI! Categories: announcements | Tags: collective bargaining, Janus, state employees, UNI, United Faculty/AAUP, University of Northern Iowa | Permalink. The AAUP has taken a look at the latest data on the faculty workforce. We looked at overall trends and broke out data on tenure-track faculty, full-time non-tenure-track faculty, part-time faculty, and graduate student instructors at different types of institutions. At its best, the tenure system is a big tent, designed to unite a diverse faculty within a system of common professional values, standards, rights, and responsibilities. Tenure protects academic freedom by insulating faculty from the whims and biases of administrators, legislators, and donors, and provides the security that enables faculty to speak truth to power and contribute to the common good through teaching, research, and service activities. But increasingly, US colleges and universities are hiring faculty outside the tenure system, into less secure positions that generally lack adequate institutional support and are often very poorly compensated. As you can see in the chart below, at all US institutions combined, the percentage of instructional positions that is off the tenure track amounted to 73 percent in 2016, the latest year for which data are available. While faculty members in contingent positions are often highly qualified and dedicated teachers, they are not given adequate institutional support. And by definition, contingent faculty lack protections for academic freedom. 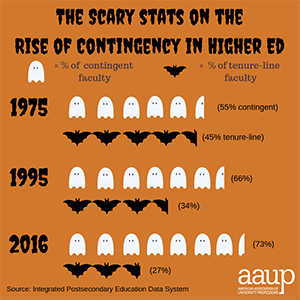 The trend toward increased contingency among faculty is troubling and it is why AAUP remains an advocate for tenure and the protections it provides, while also working on many levels to improve conditions for faculty working in contingent positions. To dive deeper into the data, read our full report here. Categories: comments | Tags: common good, contingent positions, faculty workforce, non-tenure-track, raduate student instructors, tenure-track, truth to power | Permalink.